With the unveiling of InDesign CS4 as part of its newly announced Creative Suite 4 collection, Adobe worked to bring the online and print publishing worlds closer together. Adobe says it was motivated by feedback from users of the page-layout application who see InDesign as a way to distribute content across multiple platforms. To accomplish that goal, Adobe tightly integrated the latest version of InDesign with Flash CS4 Pro. Users can employ InDesign as a layout tool, later opening that layout in Flash. Page design and typography are preserved in Flash. InDesign also includes Conditional text, which will allow you to use a document for different sets of users. For instance, if you have a document that has pricing for the U.S. and U.K., you don’t have to create separate documents—conditional text will hide the parts of the document you don’t want certain audiences to see. You can hide text at the paragraph, word, and character levels without relying on layers. Text and objects reflow automatically depending on the conditional text you choose to show in the document. Designers can now turn their page layouts into SWF files directly from InDesign. This includes the ability to insert hyperlinks, page transitions, and interactive buttons. When exported, that file will play like any other SWF file in the Flash Player. Designers can take Flash integration a step farther by exporting their InDesign document as an XFL file and then importing it directly into Flash, completely preserving the InDesign layout. Live Preflighting, which alerts designers to potential problems in real-time, highlights the enhanced page-layout tools in InDesign CS4. Of course, InDesign remains primarily a layout application, and Adobe delivered enhancements aimed at making page design and layout more efficient. InDesign now includes Live Preflight, which alerts users to potential problems in real-time. Thanks to those alerts, users can correct any errors while still in the design process, instead of going back to fix errors after everything has already been laid out. A new Preflight panel shows what is going on and makes suggestions to fix any issues found in the document. InDesign gives users the option to monitor Live Preflight on a page range or for the entire document. 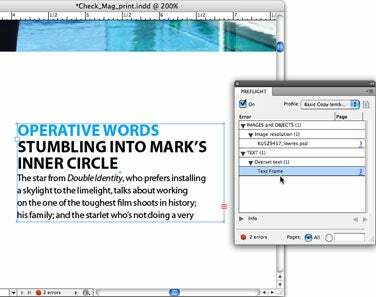 Michael Ninness, Adobe’s InDesign senior product manager, said that preflighting in InDesign is also extensible, so designers can write custom profiles and share them with the team to ensure consistent output. Other features like Smart Guides and Smart Spacing allows designers to align and resize objects using dynamically drawn guides. Smart Spacing allows you to evenly space multiple items on your page by snapping objects into position without having to use the Align panel. There are many changes to InDesign’s interface including N-up view, an application bar, an application frame, and task-based workspaces. Perhaps the biggest change is tabbed documents, which lets you view InDesign’s open documents as tabs instead of separate windows. Adobe InDesign CS4 will ship in October, priced at $699. Owners of InDesign CS3, InDesign CS2, or InDesign CS can upgrade to InDesign CS4 for $199. Owners of Adobe PageMaker 6, 6.5, or 7 can switch to InDesign CS4 for $199. InDesign is part of Creative Suite 4 Design Premium ($1799) and the Master Collection ($2499).